WOW cleverly executes its women-only celebration of Hanukkah because women are unjustifiably excluded from the state-sponsored candle lighting event at the Western Wall. The grandiose national menorah is conveniently placed on the men’s side. Last year, WOW approached NY artist Judy Sarna to create a menorah that could be sneaked into the Western Wall plaza. It had to be tall, non-metallic, waterproof and easy to construct in the dark. Judy fabricated a spectacular menorah from PVC pipes and battery-operated lights. Quite brilliant. On the fourth night of Hanukkah, WOW sisters smuggled in the menorah in pieces and assembled it - much to the dismay and disbelief of the guards. Judy belongs to the dedicated international WOW community that also includes the 1967 Six-Day War veterans - and YOU. We are sisters and brothers “in crime,” outsmarting the system to prove that Jewish ritual belongs to all women, and that there must be gender equality and freedom of religious expression at the Western Wall. 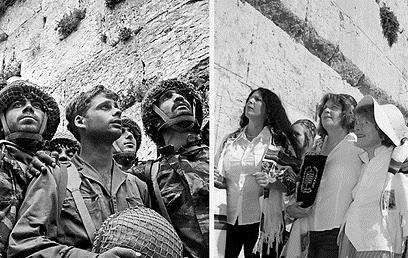 Donors of $360 - $719 will receive a photo of the 1967 Western Wall liberators – taken by the famed photographer David Rubinger – side-by-side with a photo of WOW warriors. Anat Hoffman will autograph the photo. one of the 1967 Paratroopers in the original photo (middle). This rare collectible will be accompanied by a Certificate of Authenticity for the signatures. Suitable for framing, the photo will be cherished by future generations. Joseph & Harvey Meyerhoff Family Charitable Funds.